You must be living under a rock, if you’re one of those who haven’t moved their personal stuff and important data to the cloud already. Running out of storage and removing apps from the phone – those days are behind us now because we have moved on; the world has moved on. No wonder cloud is the buzzword these days. Cloud is more like a virtual online space that relates to the amount of data being generated, moved, processed, and stored for longer periods of time without any signs of slowdown. If you don’t already feel compelled to have a converged data and storage network, you are yet to understand the true potential of cloud computing and storage. Cloud storage is in play all around us, used in various forms and for different purposes. We rely on cloud storage as it offers cheap and unlimited data storage for use by multiple devices. All the data is stored in cloud which is managed by hosting companies, commonly referred to as cloud storage providers. The most popular and trusted cloud storage providers are Amazon, Google and Microsoft, with more and more third-party cloud service providers keep on emerging. OneDrive and Dropbox are the two most recognized and trusted cloud storage providers today that allow you to store and access your data on-the-go. We highlight some key differences between the two to determine which one’s better. OneDrive is one of the most popular and widely used cloud storage services owned and managed by tech giant Microsoft. Formerly called as SkyDrive, OneDrive is an online storage service sold by Microsoft, which has some features woven into Windows, to make it easier to store and access your files stored on Microsoft’s servers in the cloud. If you have a Microsoft account such as an Outlook ID, Hotmail ID, or anyone from a dozen other Microsoft accounts, then you already have free, ready-to-use OneDrive cloud space, where you can store all your personal stuff and documents and easily access them from multiple devices from anywhere you want. You get some free space when you signed up for OneDrive initially and if you need more space, then you pay for it. The more you pay, the more you get. Dropbox is a global collaboration platform and a modern workspace that’s revolutionizing the way people work together. It is one of the most prominent names in the cloud storage ecosystem which continue to impress with its host of user-friendly features. Dropbox first appeared in the summer of 2007 at the Y Combinator Demo Day and publicly launched its service in 2008. Since then, Dropbox has grown to a millions of users worldwide, allowing them to sync and share files conveniently. It works on virtually on every mobile device including a personal computer and a smartphone with internet access. It is incredibly easy to use for basic file syncing – just install Dropbox, log in and you’re good to go. Your files now appear on all your devices for you to access on-the-go. What is OneDrive and Dropbox in General? OneDrive is an online storage service sold by Microsoft, which has some features woven into Windows, to make it easier to store and access your files stored on Microsoft’s servers in the cloud. Anyone with a Microsoft account, whether Hotmail or Outlook ID, can enjoy a free, ready-to-use OneDrive cloud space. Dropbox is a global collaboration platform and one of the most prominent names in the cloud storage ecosystem operated and owned by California-based Dropbox, Inc. It works on virtually on every mobile device including a personal computer and a smartphone with internet access. – OneDrive offers 5 GB of cloud storage space for free when you initially sign up. However, you need to pay more for extra storage. You can upgrade to the 50 GB storage plan for $1.99 per month; or the 1 TB cloud storage for $6.99 per month or $69.99 per year; or the 5 TB plan for $9.99 per month or $99.99 yearly. The OneDrive Business offers 1 TB of free space for $60 a year, while the Business Advanced plan offers unlimited storage space for $120 a year. Dropbox, on the other hand, only offers 2 GB of free cloud storage compared to 5 GB of OneDrive. Dropbox runs referral programs though, to allow users to earn more free space through referrals. Dropbox Plus offers 1 TB of free cloud storage for $9.99 a month ($119 a year), while Dropbox Business plan offers 2 TB of free cloud storage for $15 a month or $180 a year. OneDrive is clearly the winner in terms of free storage and pricing model based on paid plans. – OneDrive comes preinstalled with Windows 10 devices and if you have a Microsoft account, then you already have free, ready-to-use OneDrive cloud space, where you can store all your personal stuff and documents and easily access them from multiple devices from anywhere you want. OneDrive limits file size uploads to a maximum of 10 GB, regardless of whether you upload from a web browser or your mobile devices. Dropbox, on the other hand, limits file size uploads to a maximum of 20 GB, when uploaded through a web browser, but there is no limit on file size if uploaded from desktop or mobile app. Both OneDrive and Dropbox are the two most recognized and trusted cloud storage providers today that allow you to store and access your data on-the-go. OneDrive is an online storage service managed and owned by Microsoft, while Dropbox is a global collaboration platform and cloud service owned by Dropbox, Inc. OneDrive offers 5 GB of free cloud storage compared to a mere 2 GB of free cloud storage in Dropbox. However, the OneDrive’s $9.99 monthly 5 TB storage plan is a real deal. Both provide file encryption for added security, but OneDrive provides the encryption exclusively for paid accounts. Sagar Khillar. "Difference Between OneDrive and Dropbox." DifferenceBetween.net. 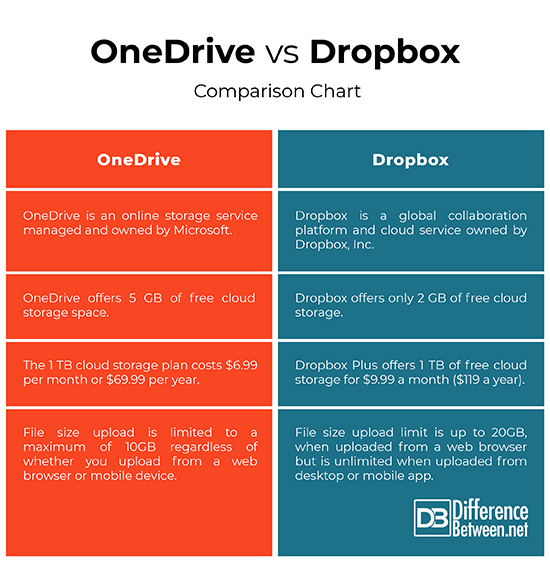 January 17, 2019 < http://www.differencebetween.net/technology/difference-between-onedrive-and-dropbox/ >.